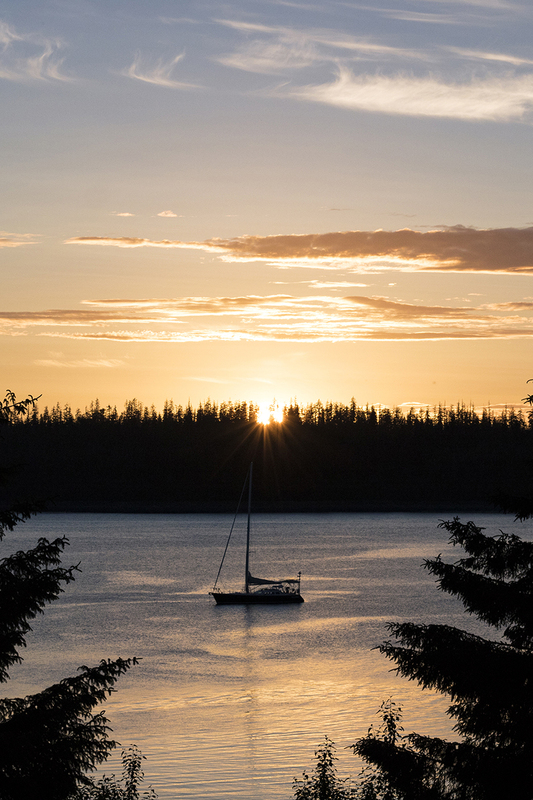 The golden sunset on our second night in Alaska. I had the opportunity to spend a week in Alaska with my boyfriend and our family at the end of June. I've posted a lot of snaps on Instagram, but it's time to start sharing on Lumière & Lens! 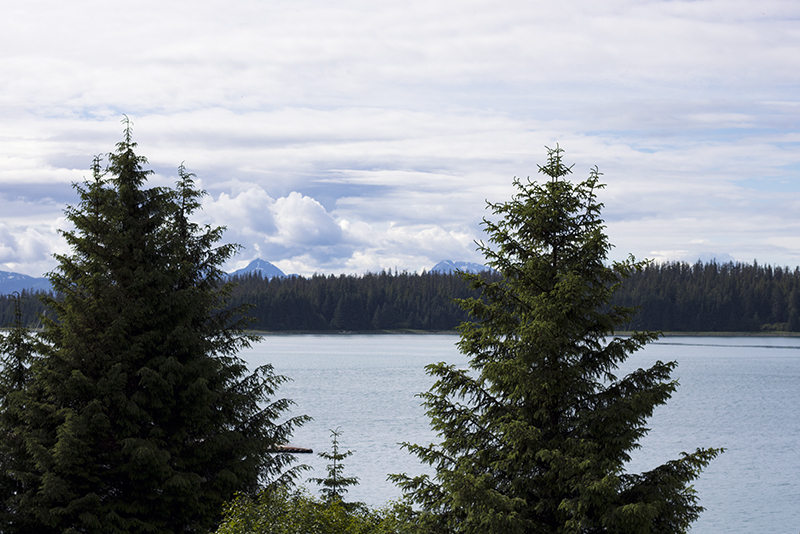 Since I took so many photographs, I figure I'll split this up into several posts so this first one is about getting to Alaska and our location. 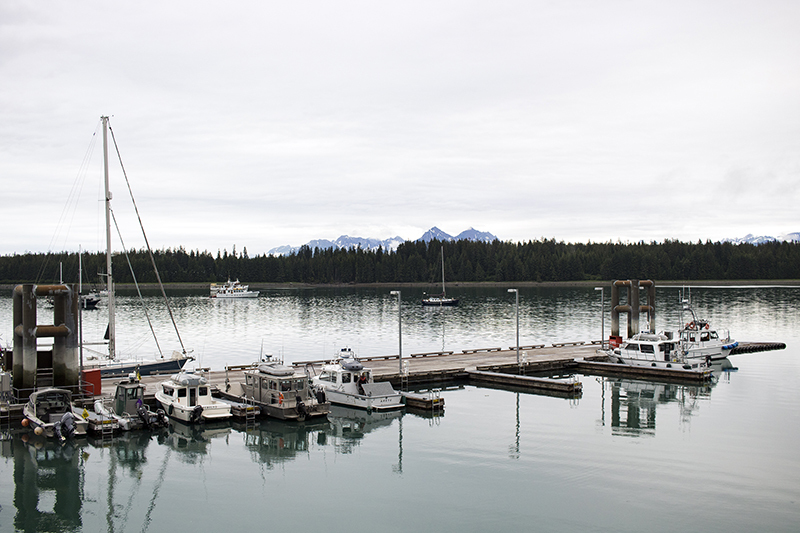 We stayed at the Glacier Bay Lodge in Gustavus, Alaska which is inside Glacier Bay National Park and Preserve. In order to get there, we had to fly to Juneau, Alaska and take another plane into Gustavus. Like the city, Gustavus airport is tiny (about the size of a house). 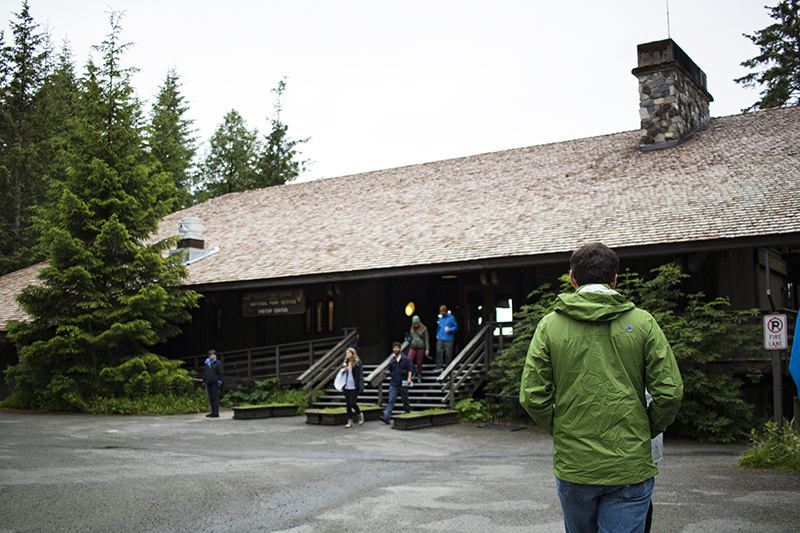 We were shuttled to the lodge and found that there was absolutely no cell phone service. We had WiFi in the lobby of the lodge, but that was it! I had a minor moment of panic before reminding myself that people don't hang out in the wilderness to stare at their phones. Glacier Bay Lodge (top) and the boardwalks between rooms (bottom). The lodge was composed of wooden buildings. Everyone who worked there was really nice. Come to think of it, I didn't meet a single rude person in Alaska! The rooms had blackout curtains because of how late the sun set in Alaska (not until 11:00 PM). I have always dreamed of living in a Scandinavian country and Alaska was as close I've gotten to it. Coming from Southern California, it was absolute heaven to hear rain and feel cold again. I fell asleep most nights to the sound of rain against the windows and walked under a light drizzle each morning. How wonderful it was to breathe crisp, clean air and feel water on my skin! Bartlett Cove viewed from the lodge. 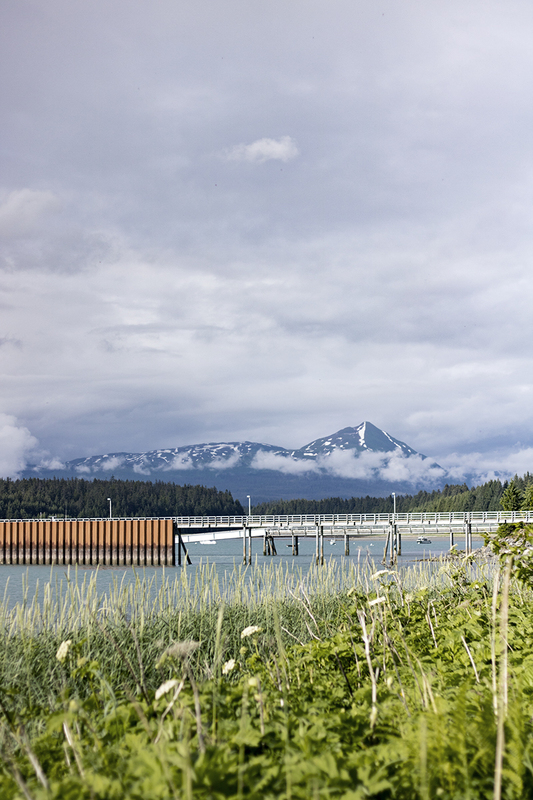 Mountains, the dock, and beach flora. 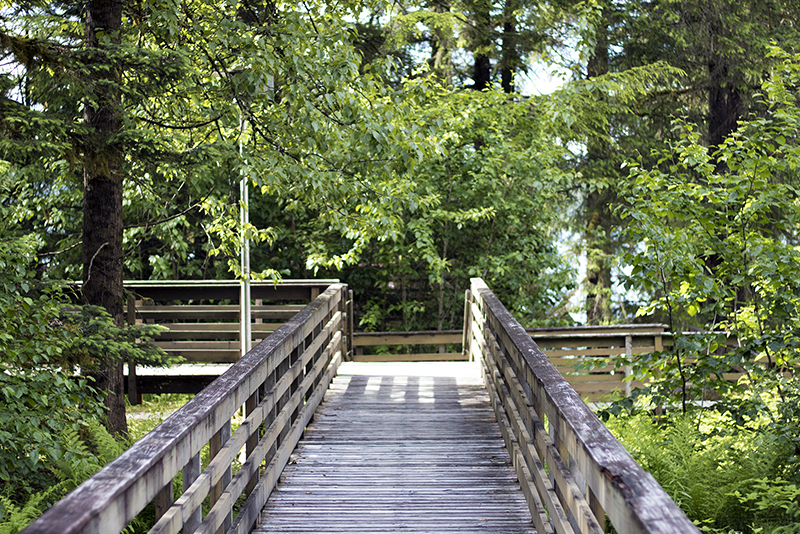 The wooden dock on Bartlett Cove. The lodge was situated right by Bartlett Cove so it was just a short walk to the shore and docks. When the clouds would allow it, the mountains were visible in the distance, behind the forest of trees that lined the cove. I walked out there as much as I could because I'm rarely near the sea in Pasadena. The water was calm and reflected the surroundings like glass. 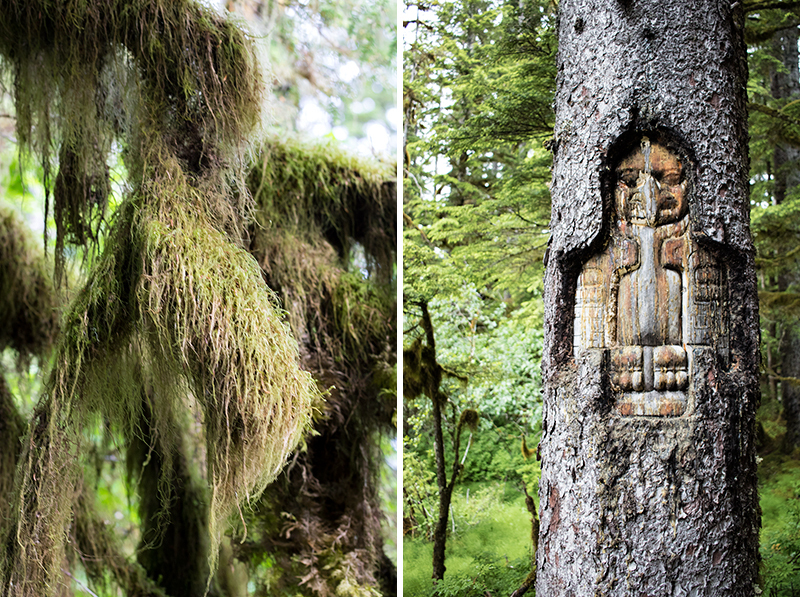 Walking on the Forest Loop Trail (top), the moss that grew everywhere and Huna Tlingit carvings (bottom). We settled into a routine of living slowly in Alaska. We would wake up early each morning, eat breakfast, depart to the day's activity before returning for supper. After supper, we would always freshen up and then take a walk on the Forest Loop Trail. The forest was dense with trees, lichen, and moss that grew on everything. 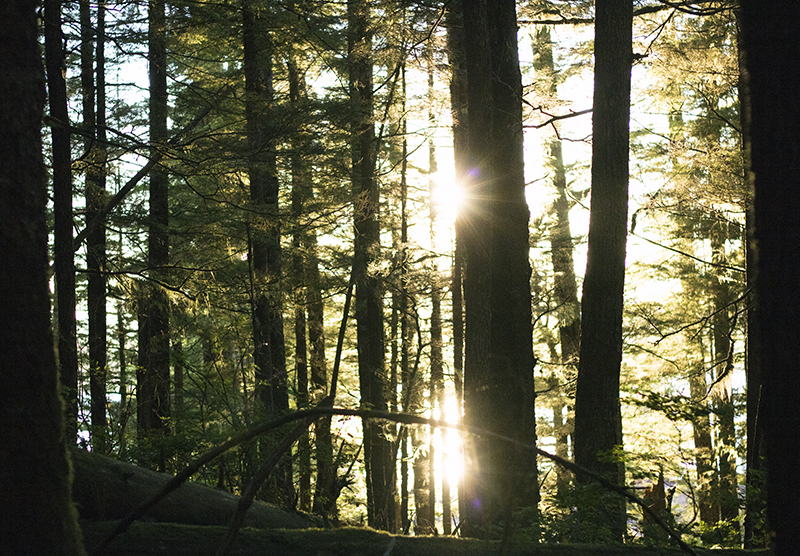 Here and there, we would see carvings in the trees made by the native Huna Tlingit tribes. The forest was peaceful; all you could hear were the sounds of yourself, the birds, rain, and other animals. One night, we were treated to a golden sunset in the wilderness! A sunset through the trees. The city of Gustavus is very small. There is no hospital, no police, and no movie theater. They have one organic food market, a convenience store, a coffee shop, some galleries, and a pizza place that is open two nights a week. On our second to last day there, we walked the one big road in the city into their "downtown" area (just two store fronts and a gas station). The forest clears up as we get into town. We could tell how close we were to town by the bars of cell service we had! 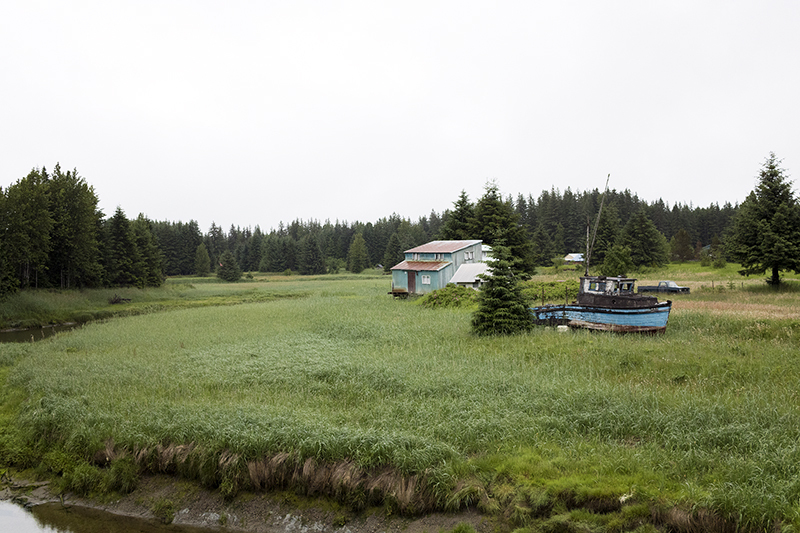 On the way, we passed by a small winding river called the Salmon River which had an abandoned boat on its shores. Salmon River (top) and the abandoned boat (bottom). 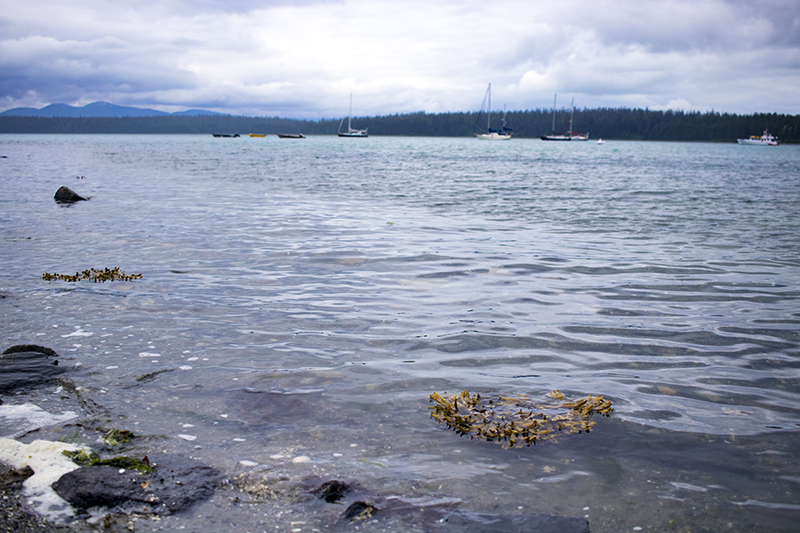 On our last morning in Alaska, I wanted to walk along the beach so we went to the shoreline around the cove. 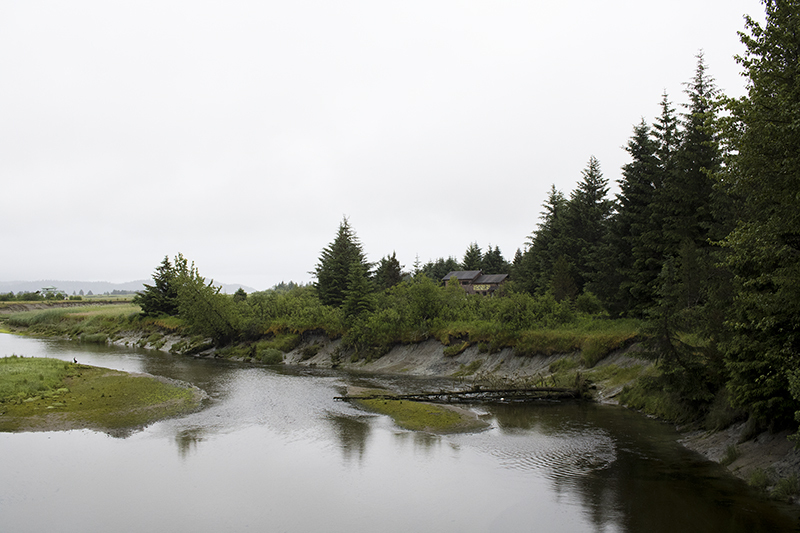 We walked on wet rocks in the intertidal zone where I pocketed small pebbles that were smoothed by the water. Back in the lodge, I rinsed them off and packed them into my bag. It made the departure from the heavenly dreamland a little easier. Those rocks now sit on my dresser, little pieces of Alaskan shore with me in California. Your trip out to Alaska looks super fun! Haha, you're right about how people don't stare at their phones in the wilderness! That was the case up in Yosemite. I was kind of freaking out that I didn't have cell signal at night. Whoops @___@. You had some amazing views up there! You definitely got lucky and escaped the heat (now I know what to do during summer XD). The forest does look really peaceful. I've never thought about vacationing up in Alaska but you legit convinced me to plan it one of these years! It's cool that you brought yourself a few Alaskan rocks back home :). Yes! I've been waiting for more Alaska content! This trip looks and sounds so beautiful. I can't get enough of these photos. You've just made me want to take my own trip even more. Amazing pictures! Love the greenery and the stillness of everything -- what a contrast to daily life? I especially loved that you picked up a memento for yourself :) can't wait to see more! Also no cell phone service means taking in ALL the beauty, right? These photos are awesome- this place looks SO beautiful! I can't believe I've never thought about Alaska before. By the looks of it it's seriously underrated as a travel destination. Alaska looks SO beautiful! 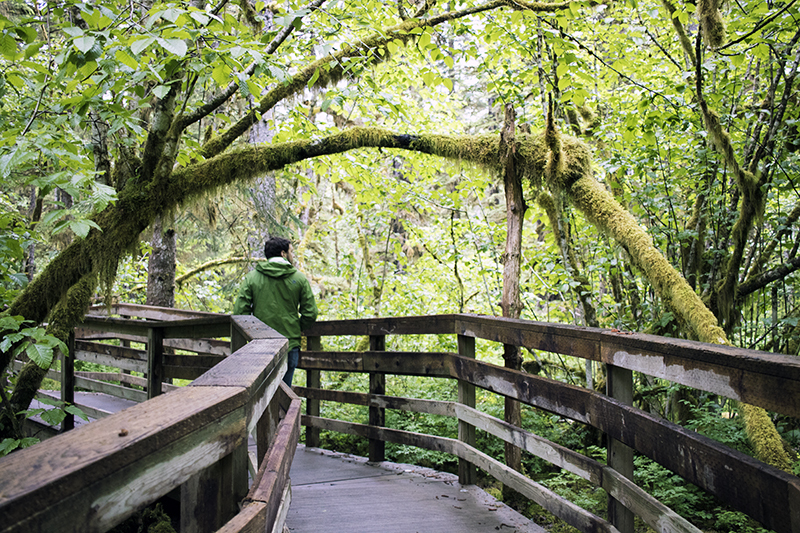 The shaggy (mossy) trees remind me of the Hoh Rainforest in Olympic National Park, Washington. And I can't imagine you'd ever find a mean person in Alaska! Hey there - just popping by! Found you on Twitter from my blogger friend, Eena! Thought it'd be awesome to connect. I really enjoyed looking at your photos and reading about your adventures in Alaska. Thanks for sharing :) It's always nice to go on trips like this where there is no WiFi signal for you to just explore and really re-connect with the world. You've inspired me to take a trip down somewhere similar in the UK! OH MY GOD ALYSE. THESE PHOTOS ARE SO BEAUTIFUL. Alaska should hire you for their tourism department or something. I've never really thought of visiting Alaska before but this is making me want to go! !